Thomas Mann's bold and disturbing novella, written in 1952, is the feminine counterpart of his masterpiece Death in Venice. 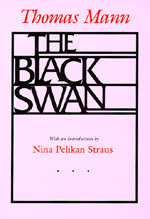 Written from the point of view of a woman in what we might now call mid-life crisis, The Black Swan evinces Mann's mastery of psychological analysis and his compelling interest in the intersection of the physical and the spiritual in human behavior. It is startlingly relevant to current discussions of the politics of the body, male inscriptions of the feminine, and discourse about and of women. The new introduction places this dramatic novella in the context of contemporary feminist and literary concerns, bringing it to the attention of a new generation of readers. Thomas Mann (1875-1955), winner of the Nobel Prize for Literature in 1929, wrote essays as well as some of the great fiction of the twentieth century, including Buddenbrooks, The Magic Mountain, Death in Venice, Joseph and His Brothers, and Doctor Faustus. Nina Pelikan Straus teaches in the Humanities program at SUNY, Purchase and has published articles on Mann's Dr. Faustus and Kafka's Metamorphis.